Former Connecticut Gov. John Rowland, out of prison since last May, is scheduled to speak at a breakfast meeting of a men’s group in Darien on Feb. 8. “This may be Rowland’s first public speech since his release” from federal custody, according to the CT Politics newsletter, published by Hearst CT newspapers. John Rowland, as governor, speaking at a 9/11 memorial at Sherwood Island State Park in Westport. Rowland is speaking before the New Canaan chapter of the New Canaan Society, a national, nondenominational Christian men’s group founded in New Canaan. The chapter holds meetings in Darien. Doors open at 6 a.m., and breakfast begins at 6:30. The meeting starts “promptly” at 7 a.m. and will end no later than 8:15 a.m. The cover charge is $20. According to the CT Politics newsletter: “All men are welcome to attend for the price of $20, the organizers say. Apparently, women are not invited.” Darienite.com could not find information on the group’s website regarding who can attend. Rowland, 61 was governor of Connecticut from 1995 to 2004. He went to prison twice: The first time, came after he pleaded guilty to the federal crime of “honest services fraud” in connection with a scandal in which renovation work was done on his home by a company with state contracts. He was released from federal prison in February 2006, having been incarcerated just over 10 months. In September 2014, Rowland was convicted of committing federal campaign finance law violations for receiving money for work as a campaign consultant that was hidden from federal filings. He was released from federal custody in May 2018 after serving 15 months at a prison camp. “Because of his journey, he brings the insight and candor of a political leader who has seen great success and has learned exceptional lessons from the challenges faced at the end of his public service career,” the New Canaan Society chapter said in its announcement of the event. 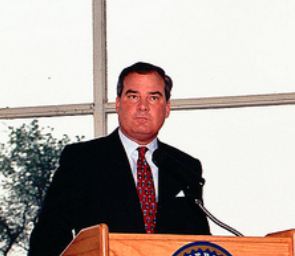 Elected to the Connecticut State House of Representatives in 1980 at the age of 23, John Rowland rose rapidly to serve three terms in [the U.S.] Congress before being elected the youngest governor in Connecticut history in 1994 and then re-elected two more times. He was called by the Wall Street Journal “one of our nation’s rising stars”. His public service career resulted in a renaissance throughout the cities of Connecticut. His vision brought the University of Connecticut and all the public universities to the first rate educational facilities they are today. During his years in office Connecticut experienced record budget surpluses, tax reductions, job growth and economic expansion. His focus on the inner cities and cultural investments in the arts helped rejuvenate our communities. OK, that’s the good part, now the bad part. Years after serving 10 months in a federal prison camp, Rowland hosted “Church and State” a popular radio show on WTIC-AM with Pastor Will Marotti. After almost five years on the radio he was convicted on campaign finance violations and spent an additional 15 months in a federal prison camp. Rowland began working for Prison Fellowship within a month after getting out of prison. The group, founded by Charles Colson, who had gone to jail after a Watergate-related conviction, helps freed inmates with the transition back to life outside of prison.